Bob Lee was a Chicago record man who had his fingers in a lot of pies in the 60s – promo work, writing, managing, producing he did it all. And like a lot of his brethren he owned a few labels as well, Hawk being one of them. I’d say that Charles Farren was one of the most accomplished vocalists Lee ever worked with and his tough no nonsense gruff tones showed what strength in depth the Windy City had in that period. Of course the dancers go for “You’ve Changed My Whole Life Around” and it’s pretty good hard Chi Town soul as well in truth, but the flip A Girl Like You is way better. This minor keyed ballad has a great bluesy feel from a tasteful guitarist and horns especially the emphatic baritone sax, but the church side of things comes from the busy organist and Farren’s high octane vocals. Great falsetto bursts and some really forceful “rough” toned phrases and screams make this a singer to savour. Sadly his second 45 isn’t quite up to this standard. 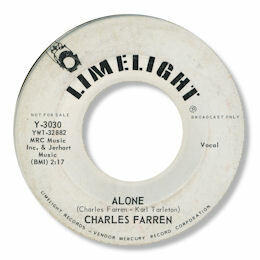 “Alone” is a rather undistinguished ballad and while “You Got Everything” has a lot of energy the structure of the song – especially the chord changes – leave a lot to be desired. UPDATE ~ Davie Gordon writes to say that "The Limelight single was issued in August '64, the Hawk issue was probably about June of that year. 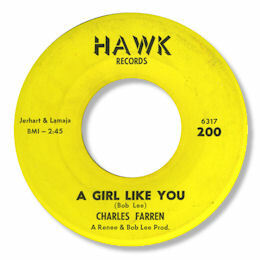 The Hawk label's releases are hard to date accurately but I think they're all from 1964." My friend Greg Burgess also has some fascinating news. "I think that Charles Farren is the secular name of Leon 'Snooky' Lumpkins who lead the Gospel Clefs for many years. He was born on April 26th 1934 in Newark.NJ. The Clefs most famous record is "Open our eyes" a Savoy cut from 1958 that Earth Wind & Fire subsequently covered. I'm afraid Charles Farren /Leon Lumpkins died on October 14th 2007 in Newark NJ."